Birds are beautiful and elegant but they can also be very loud, especially if they are a large pet bird that lives in your house. Parrots are especially known to be loud but is it normal for them to scream? Occasional screams are normal but if you find that your bird screams a lot it may be because something is wrong. Birds in the psittacine family, such as macaws, African greys, and other parrots, make a variety of noises and many can even mimic words we say and other sounds they hear in our homes. But some noises are also very natural and normal for a bird to make. Squawking, cooing, chirping, trilling, purring, chuckling, and other noises will be made by both wild and pet birds. Learned vocalizations on the other hand, such as words, noises bird hear in our homes like phones ringing and oven timers, and kissing noises are all learned by pet birds that live with humans. They are typically welcomed and often even regarded as being cute and encouraged. Other noises that birds make, such as screaming, may start as just another natural vocalization, but can quickly become annoying. Screaming is a natural reaction to being scared or startled. The noise is often accompanied by some body language (such as pacing and puffing up) but pet birds, unfortunately, can also start screaming for other reasons that should be addressed. Just like us humans, our pet birds can get scared and scream out of fear or jealousy. 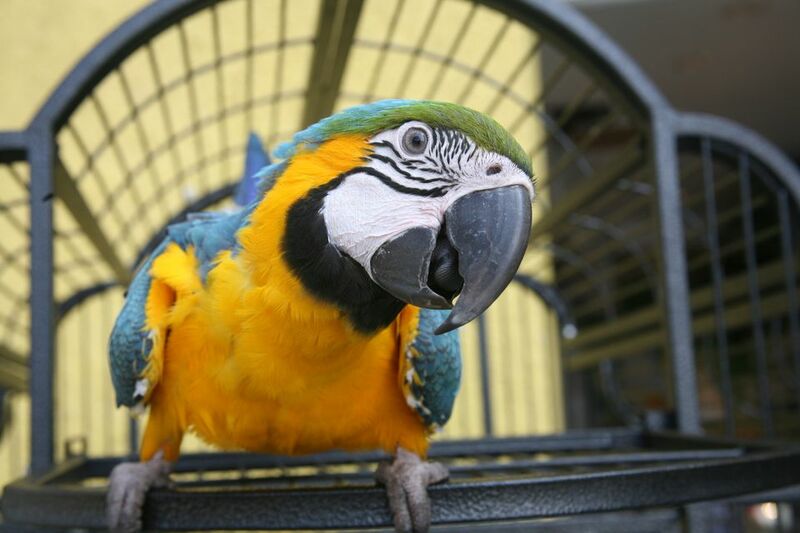 One common reason for your pet bird to get scared at home is when they see a potential predator. Animals outside, such as other birds (like hawks) or cats, as well as other pets in the house may scare your bird and cause them to scream. This scream is usually accompanied by stalking or pacing, fiercely staring at the predator, and puffing up to make themselves look bigger. They will only scream like this when they see this predator so by blocking their line of sight out of the window or removing the predator from their environment in another manner should stop the screaming. Other reasons why your bird may be scared can be numerous. Vet visits are often scary since they aren't a regular occurrence and your bird doesn't know what is going on, new people in your house can frighten your bird and cause them to scream, and even unknown noises, new toys, a change in furniture in the room they live in, or a new cage can startle or scare your bird. Sometimes it is not obvious what is frightening your bird but if you pay attention to them and what they are looking at when they scream you should be able to figure out the culprit. Jealousy is often seen in birds that bond with their owners or another bird. When their bonded mate is interacting with another person or pet they may scream to let them know they are upset. The most common problems large bird owners have with their pets are usually behavioral issues, including screaming. Birds are very active, intelligent, and need constant mental stimulation in order to stay happy and healthy. If they get bored they will tell you in some way. Boredom is often exhibited with destructive behavior, obsessive behaviors like pacing, biting, feather or skin picking, or screaming, among other things. Screaming may start as a normal reaction to something or a quick alarm for attention. It can then develop over time into an annoying, lengthy, ear piercing noise that affects your quality of life. Bird screams can worsen over time because many people naturally react to their bird screaming by yelling back. But this yelling back only reinforces your screaming bird. When you scream at your bird to be quiet or stop, they think you are both yelling and they are getting attention so they do it more. In order to stop the screaming attention seeking behavior, you need to give your bird something to do other than scream. Enrichment activities that keep your bird busy and mentally stimulated are the best ways to decrease this type of behavior. Ignoring the screaming is very hard for anyone to do so it is often easier to prevent the behavior. If your bird is not screaming out of fear but rather for attention, you can prevent this behavior by keeping them busy. Birds spend the majority of their wild lives flying and searching for food but as pets we often fail as owners by clipping their wings, restricting their flight, and having them sit on a perch for a large portion of their days with us. This is not only unnatural but very boring for your bird, therefore, they cry for attention in the form of an ear piercing scream. A number of toys meant to make your bird use their mind and give them something to do can be purchased or made at home. Other enrichment activities such as hiding food, rather than just filling a bowl up with food, can also be provided to your bird to keep them occupied for a while. Videos of other birds, music, sounds of bird calls, or other visual and audible enrichment can also help keep your bird's attention. These things will keep your bird from getting bored and screaming for attention. Another tactic to decrease or stop your bird's screaming behavior is to replace or substitute it with another acceptable behavior. Many people, instead of yelling back at their screaming bird, repeat a specific word and teach their bird to say this word instead of scream. They also practice positive reinforcement by rewarding their bird when they are doing things that are acceptable and ignoring behaviors that are not. Ignoring screaming is very hard, especially if your bird has developed a bad habit of it. Start by increasing enrichment opportunities, rewarding good behavior, covering your bird's cage if they are screaming, and ignoring the screaming by saying nothing to them while they are doing it. With patience and persistence, you can break the habit and help your bird have a happier, quieter life.